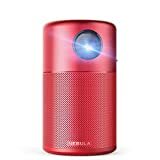 Just like pretty much everything else Anker makes, people love the Nebula Capsule Smart Mini Projector. It costs about the same price as a standard high-quality portable pico projector, but it’s so much more. First of all, if offers crazy battery life of up to 4 hours per charge. That’s more than double what you can expect from most pico protectors. On top of that it has built-in 360° stereo sound, and it connects to your iPhone or Android device wirelessly so you don’t have to worry about carrying around extra cables. It’s normally $350, but Amazon’s current sale slashes the price of the sleek red model to just $309.99. That’s a great deal, but it won’t last long. NOTE: Copyrighted content from Hulu, Netflix, and similar services CAN NOT be mirrored or screencast. Download and use the apps directly through Capsule to view copyrighted content from these providers.